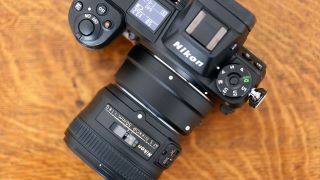 Nikon’s Z6 and Z7 full-frame mirrorless cameras may have plenty to recommend them, but, as with any new camera system, native lens options are limited for now. With only three lenses at the system’s launch, and two further options announced after that, the company will be working hard to pad out its stable of optics. Many more options have been promised, but it will still take time to get to a full range of affordable and premium lenses to make the line accessible enough for a broad range of users. Fortunately, Nikon has made it super simple to use F-mount lenses designed for its SLRs and DSLRs on these bodies through the FTZ adapter, which can be bought at the same time as the body or separately. This adapter provides full compatibility with 90 modern lenses, and partial compatibility with hundreds more, so it’s a no-brainer if you already have one or more F-mount lenses in your kit bag. Even better, lenses mounted this way can benefit from sensor-based Vibration Reduction, which makes lenses that lack this technology more suitable a slower shutter speeds (although you may need to program the focal length in first for some lenses). Here, we pick five F-mount lenses that you can use on the Z6 and Z7 that in some way stand out, be it for their uniqueness, usefulness or something else. Nikon already offers a native 50mm f/1.8 lens for its Z system, but it’s larger and considerably more expensive than the option available for DSLR users. That may well be to do with its optical excellence, but not everyone will be prepared to spend this much on a 50mm f/1.8 lens. Can I use AF and AE? The FTZ adapter allows for autofocus and auto-exposure when you’re using AF-S lenses (type G/D/E), whether they’re DX format lenses designed for APS-C cameras or FX-format ones for full-frame models. It also supports autofocus and auto-exposure when using the newer AF-P type G/E lenses and type-D AF-I ones. Fortunately, the 50mm f/1.8G AF-S designed for the company's DSLR pairs perfectly with the Z6 or Z7, with autofocus and auto-exposure support as standard. Being so small also means that it doesn’t add too much to its footprint. It’s probably better on the Z6 rather than the Z7, particularly when used wide open where it can be a little softer than when stopped down, but as walkaround lens it’s hard to fault. Vibration Reduction from the camera and that wide aperture also make it a powerful combination in low light. Nikon’s current lens roadmap for the Z system doesn’t cite any telephoto lenses over 100mm as being on the horizon, nor any macro types, so this AF-S VR Micro-Nikkor 105mm f/2.8G IF-ED is particularly relevant for Z6 and Z7 users. This has been a popular macro option for Nikon photographers since launch, and while it’s been on the market for some time it’s still packed with up-to-date tech, from a nippy Silent Wave Motor and Vibration Reduction through to Super Integrated Coating and Nano Crystal Coat technologies. This older optic is one of only a handful of still-current telephoto prime lenses that lacks Vibration Reduction, so anyone used to using it handheld will immediately see the benefit of this from the camera. Theoretically, the five-stop advantage of the VR systems inside the Z6 and Z7 should mean that you can get usable images captured at shutter speeds as low as 1/10sec. Those shooting static nature subjects can keep it on the Normal mode, while those capturing anything that’s moving can switch to the Sports mode through the camera, whereupon the system will only provide stabilisation for the relevant axis. Again, it’s entirely possible that Nikon will end up releasing a similar telephoto lens for the Z system at some point, but this is clearly a more niche option and it’s not on the radar just yet. If you use an F-mount lens that lacks VR, the sensor will correct for yaw and pitch movements as well as roll. If, however, you mount a lens with VR on the Z6 or Z7, the lens will correct for yaw and pitch while the camera correct for roll. This longer-than-usual zoom has traditionally been – and continues to be – bundled as a kit option with some of Nikon's previous full-frame DSLRs. With a 5x focal range it delivers considerably more reach than the average 24-70mm lens that would ordinarily be partnered with these kinds of cameras, although its maximum aperture is a stop slower throughout. Even so, the presence of Vibration Reduction in both the lens and the Z body on which its mounted means you can get away with using it successfully in lower light, where you'd normally open up the aperture. The fact that it also reaches a little further that usual means that you may still be able to isolate subjects from their backgrounds. It doesn't appear that Nikon has such a lens on the card right now for its Z series cameras, so this versatile zoom will no doubt get a lot of love from those looking for a suitable optic for travel and holidays, or just as a general walkaround lens. This super-wide prime lens from Sigma is unlikely to get any direct native rivals for the time being, partly because Nikon hasn't declared it's developing such an optic, but also because it's somewhat niche. Its ultra-wide angle of view and bright maximum aperture means that it's ideal for astrophotographers, although if you need this kind of focal length and you're happy to do with a smaller maximum aperture, Nikon's Z 14-30mm f/4 S and the upcoming 14-24mm f/2.8 S lenses are also worth keeping in mind. This was also one of a number of lenses deemed by Sigma to work perfectly well with Z-system cameras when used though the FTZ mount, with autofocus and auto-exposure maintained.